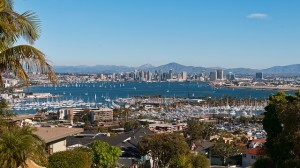 Occupying a hilly peninsula of the same name, San Diego’s Point Loma is home to approximately 48,000 residents and several distinct neighborhoods. Often described as “where California began,” the area is the landing point of the first European expedition, in 1542. Today, it is the location of two major military bases, a national cemetery and monument, and a university, in addition to its commercial and residential districts. It is also where Charles Lindbergh tested and flew his plane “The Spirit of St. Louis,” which had been constructed in San Diego. Point Loma Village and, more recently, Liberty Station, are the community’s retail and commercial centers, serving civilian and military residents as well as visitors to the area for historical, marine and yachting interests. Point Loma’s La Playa neighborhood hosts some of San Diego’s most expensive homes. Some even come with their own private piers.